Sparklers are a great way to give the newly married couple an unforgettable send-off, are incredibly fun for everyone involved, but it's important to make sure the sparklers are not lit util it is confirmed that the bride and groom are absolutely, positively ready to come out. Otherwise, you will end up departing not through a brilliant line of sparklers, but instead through guests holding burnt-out metal sticks! This is one great example of where a good wedding planner can be very beneficial, as they can coordinate handing out the sparklers to guests as they exit and can instruct them to not light them until they are told. 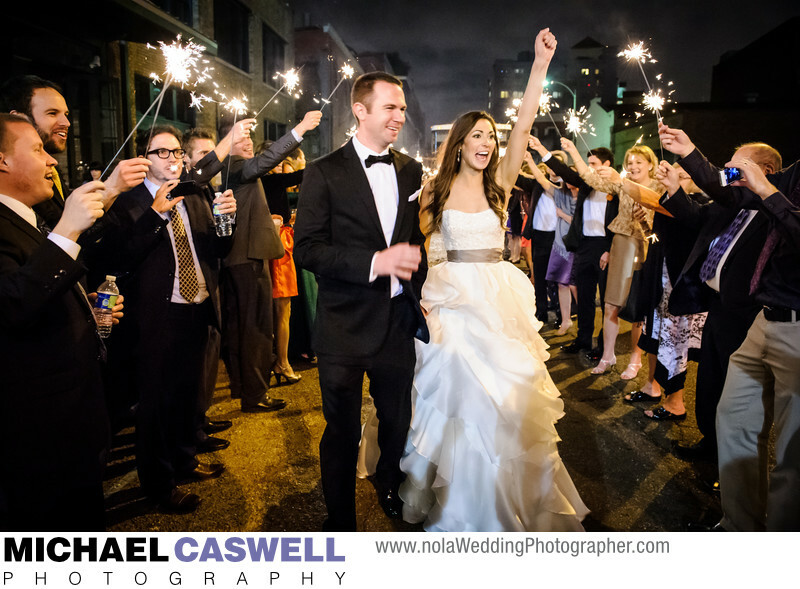 This couple had the benefit of having hired Brittani of Unique Weddings in New Orleans, who expertly handled this difficult task for this couple's departure from their wedding reception at The Chicory in the warehouse district. If you don't have a coordinator, consider asking a particularly assertive relative to fill this role.